Although the most important change to the regulations for the 2006 season concerns the engines – down from ten cylinders to eight and 3-litre displacement to 2.4 litres – there are also far-reaching consequences for the chassis construction. The V8 power units are shorter, use less petrol and require a smaller radiator surface, which has a significant effect on the car’s design. Although knowledge gained from the development of the Sauber Petronas C24 has found its way into the new car, the BMW Sauber F1.06 is every inch a new design. The front section of the new car has been given some striking new features. The chassis has been lowered considerably at the front, with the effect that the lower wishbones are no longer attached below the monocoque but to the side of the chassis. The nose of the car has also been lowered further to the ground, with its underside curving upwards slightly. Naturally, the front wing has been modified in line with the other changes through a host of optimisation measures. The reduced cooling requirement of the V8 engine allows not only the use of more compact radiators, but also smaller apertures in the sidepods. This also benefits the car’s aerodynamics. The same applies to the rollover bar with integral air intake, which has been reduced in size due to the engine’s lower air throughput. Plus, complex finite-element calculations made it possible to significantly reduce the weight of the rollover bar, while at the same time meeting the stringent safety stipulations. The exhaust tailpipes have been moved further back from their location on the Sauber Petronas C24. The new shorter engine allowed more aerodynamic freedom for the designers in the back of the car and required an extension of the length of the 7-speed transmission’s titanium casing. The different firing sequences and intervals in the V8 compared to the V10 have led to a completely new situation in terms of vibrations. With a speed range that exceeded 19,000 rpm, the V10 hit a critical zone between 12,000 and 14,000 rpm. However, the engine spent very little time in this problematic band and smoothed itself out again as the revs were stepped up. But it is precisely here that the V8 encounters problems. Its vibration curve enters challenging territory later than the V10, starting at around 16,000 rpm and becoming more critical from there, which can impact on the stability of vehicle components. And, like its predecessor with two extra cylinders, the BMW P86 V8 engine also has to last for two Grand Prix weekends. Development work on the BMW P86 V8 began in late November 2004. "In an ideal world, you would have 18 months to develop an engine," says Paschen. "However, as it only became clear at a relatively late stage that V8 engines would be stipulated in 2006, we have had to make do with 15 months up to the first race." The teams also found themselves faced with a key rule change at short notice last year. 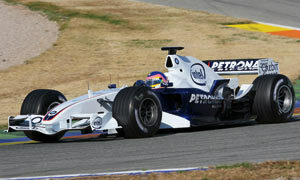 In July 2004 it was announced that the engines for 2005 had to last through two GP weekends. Plans to introduce the BMW P85 in 2005 were shelved as a result and the P84/5 was drafted in to take its place. The designation P86 restores the natural order of the naming tradition. Another critical change in the regulations is the ban on variable intake systems. Known as "trumpets," these systems could previously be used to optimize the car's torque curve. The fixed duct lengths will now make achieving good engine driveability a more exacting challenge. "The teams will have to devote a lot more time and effort to this area," confirms Paschen. "We have to strike a compromise between maximum power and good driveability." Where the best compromise for the pipe lengths is to be found depends on various factors. The track layout and the weather, for example, both play a role. The teams will favour one set of intake pipe lengths for circuits with long straights - like Monza, Indianapolis and Spa - where power is critical, and a different selection for twistier grand prix tracks such as Budapest and Monaco, where driveability relegates raw power to the back seat. The same applies to different weather conditions. Joining variable intake systems on the black list are variable exhaust systems and variable valve control systems. The power supply to the engine electrics and electronics is limited to a maximum 17 volts and the fuel pump now has to be mechanically operated. Only an actuator may now be used to activate the throttle valve system. With the exception of the electric auxiliary pumps in the petrol tank, all subcomponents must now be driven mechanically and directly via the engine. "Sensibly, a long list of exotic materials have been excluded," says Paschen in reference to another chapter of the regulations. "Now we are all working with the conventional titanium and aluminium alloys stipulated in the regulations." That means there are now fewer differences in the technical make-up of the various manufacturers' engines. However, this does not mean that the challenge for the engineers has been in any way diluted. As Paschen explains: "It's all about who can find the best solution within the framework of the new rules in terms of thermodynamics and mechanical dynamics." Indeed, mechanical dynamics and vibrations represent a particularly critical area of development for the new generation of Formula One engines. The V8 units have different firing sequences and intervals from their V10 predecessors, which leads to a totally different situation in terms of vibrations. The V10 entered a critical area between 12,000 rpm and 14,000 rpm. However, this was not an issue as the engine did not spend much time in this rev band and smoothed itself out again once the driver stepped up the revs. And, since the upper rev band was where it spent the majority of its time, vibrations were not a worry. A V8, on the other hand, is not so well off. Its vibration curve enters critical territory later than the V10 - from approximately 16,000 rpm - and continues to climb from there. The BMW P86 engine is made up of 1,105 different parts. In total it comprises some 5,000 parts, which is only around 200 fewer than in the previous ten-cylinder P84/5. 1,329 CAD drawings had already been produced for the first test of the BMW P86 V8 engine on 28th November 2005. Maximum piston acceleration of the BMW P86 is 10,000g. Peak piston speed is 40 metres per second - or from zero to 100 km/h in 0.3 milliseconds. This exerts a force of almost three tonnes on the conrod. The average piston speed is approximately 26 metres per second. The exhaust reaches a temperature of up to 950º C, while the air temperature in the pneumatic system rises to 250° C.
Over an average race distance of 300 kilometres, the BMW V8 engine undergoes around eight million ignitions per Grand Prix. When the car returns to the pits during practice or qualifying, oil samples are taken for spectrometer analysis in the pit garage. Metal traces in the oil provide important clues as to the state of the engine. It takes the Team at least eight working hours after a race to dismantle the car, test and replace individual parts and reassemble the racer. Assembling the BMW engine takes around 120 working hours. Monocoque: Moulded carbon fibre and aluminium honeycomb composite monocoque.